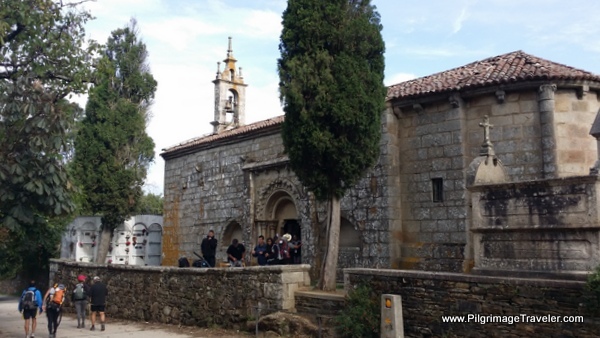 On this day eleven of our Camino Primitivo, part two, we joined the Camino Francés, and not only made a change in direction, but also found familiar faces. Our total mileage for the day, if you counted the 14.21 kilometers from part one of day eleven was 28.16 kilometers. 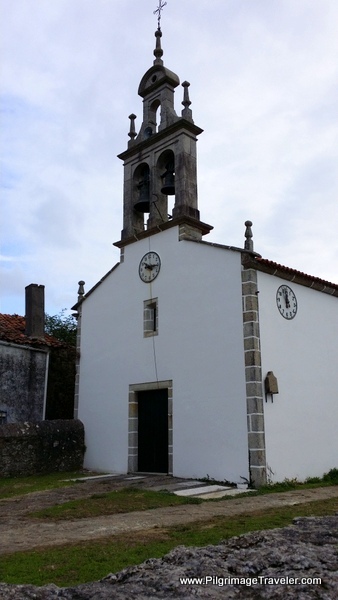 Appropriately, the juncture of the Camino Primitivo and the Camino Francés at a quaint chapel in Melide, see below, marks the final 50 kilometers to Santiago de Compostela. When you reach this city, Santiago de Compostela is so very close! My soul did not want to leave the Camino Primitivo upon arriving in the Praza do Convento in the center of Melide. 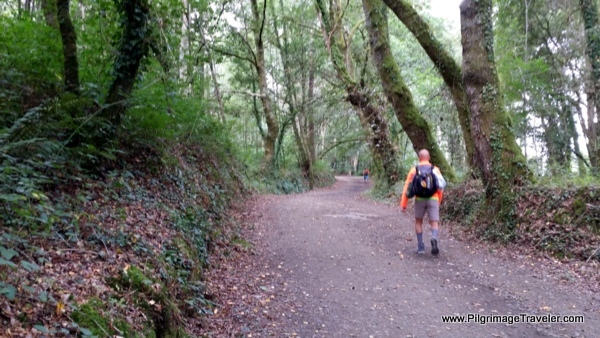 It was 10:30 a.m., and as good pilgrims do, we carried on and soon joined the Camino Francés. If you wish to spend the night here in Melide, there are many options from which to choose. See the interactive Google map of Melide for their location, or click here. There is the giant municipal Albergue de Peregrinos de Melide just beyond the square, many private ones, and hotels and pensions throughout town. As you can see from the elevation profile of day eleven part two, starting halfway in Melide, the walking is now much easier and is relatively flat, with mild elevation changes throughout the full 14 kilometers. (This elevation profile is from the standard stage on the Camino Francés). 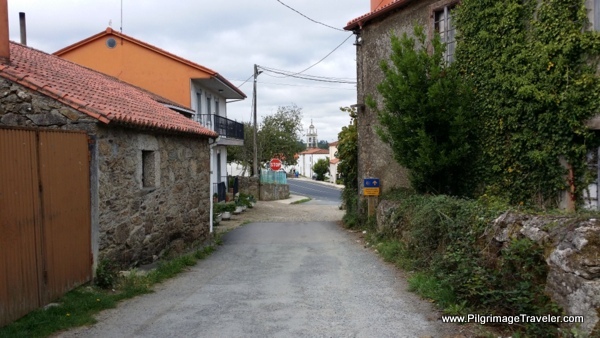 We reluctantly left the center of town on the final steps of the Camino Primitivo and after walking thru the Praza do Convento onto the Rúa Camiño do Ovedo, (see day eleven, part one for the photo of the plaza), the Way turns right (west) on the Rúa Principal. This street becomes the Camiño Santiago. Here we joined the Camino Francés! One takes this street until it ends in a walkway by a cemetery and you are essentially out of the center of Melide. 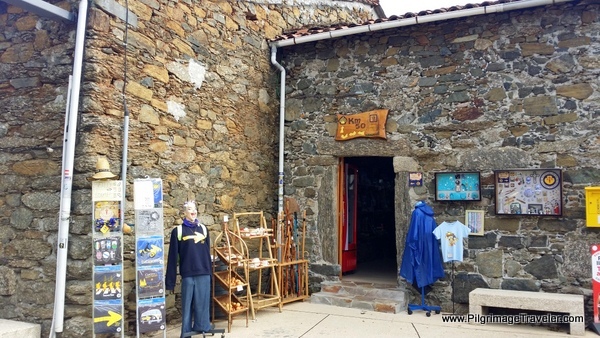 In addition to the many pilgrims we were seeing as we joined the French Way, we also knew we were on the Camino Francés, by its many shops. 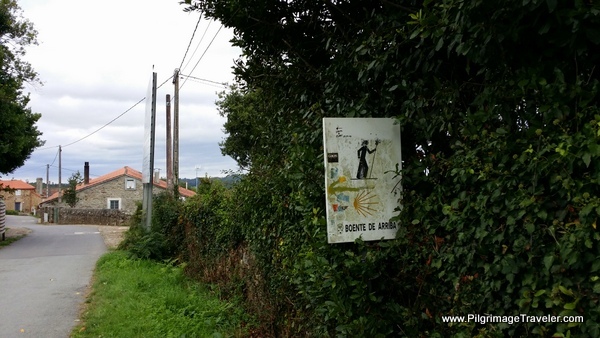 Here is one we soon encountered - welcome to the Camino Francés! Shortly after the souvenir shop, on the outskirts of town is the famous and well-touristed, Iglesia de Santa María de Melide. 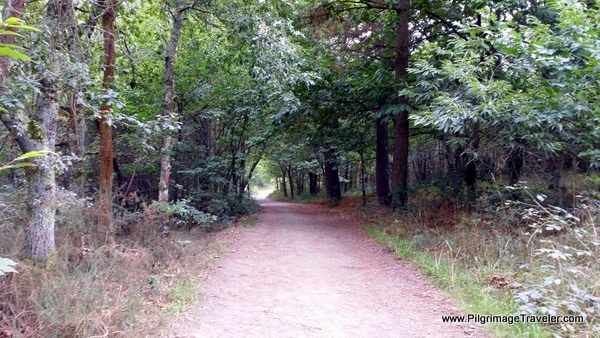 It is definitely worth a look and is appropriately located by the 50 km waymarker, that you can see in the photo below. The interior of the chapel contains some remarkable 14th Century paintings, and there is an old 8th Century Roman fountain on the grounds as well. My photo of the paintings did not turn out well, and I never did see the fountain through the throngs of people. There was a guide at the door when we entered who in rapid fire English explained the historic value of the place to any eager pilgrim ears. 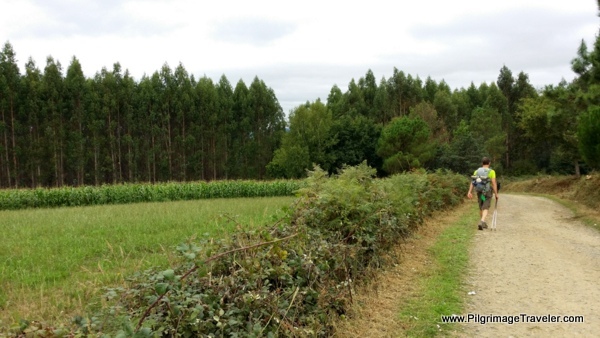 There were so many people here that after the intimacy of the Camino Primitivo, I just wanted to leave! I was not a very good pilgrimage traveler, adjusting to whatever came my way. My suggestion, is that you try to see this lovely little chapel either early or late in the day, or in the off-season. In early September, at 11:00 a.m. it was packed with pilgrims and many others. I was unable to find any information regarding the hours of its opening, so you may want to check with the locals before making any plans, if you want to see inside. After leaving the chapel, the Camino Francés yields way to a lovely, wide, off-road path, generally westward and in the shadow of the N-547. 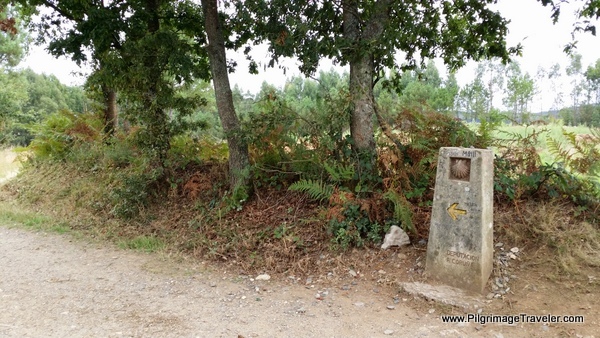 The waymarks were now very intriguing as we kept a new, determined tempo to get to Santiago de Compostela more quickly. We were moving at a much faster pace on this flat terrain. The waymarks took on a different look when we joined the French Way. 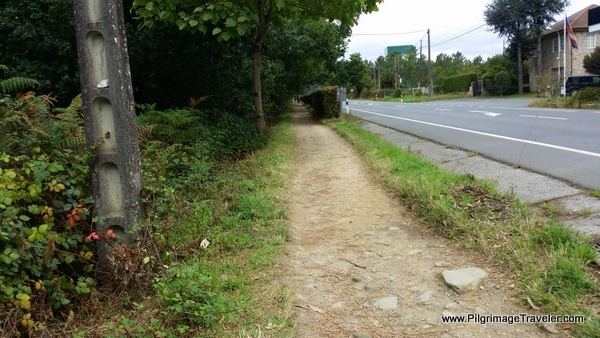 We were very surprised at the many off road paths we found on the French Way on our day eleven on the Camino Primitivo, part two. They were often very shaded and walked thru tree-lined countryside! 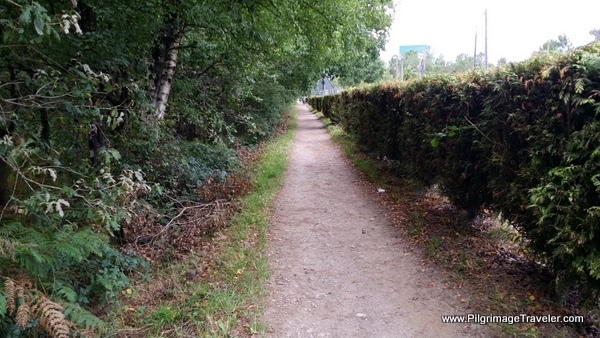 Essentially, after Melide, the French Way continues to follow to the south of the N-547 on these nicely shaded paths. We frequently traveled into and out of forests like in this photo, below. 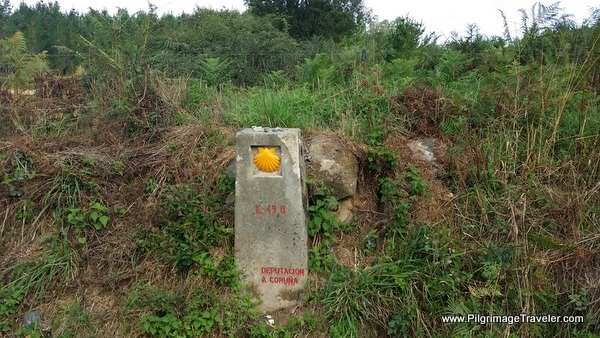 The Camino does join the N-547 in Barreiro de Abaixo, but never walks onto it, but onto a path beside it. It once again turns off the N-547, on country paths and quiet pavement to walk into Boente, shown on the sign below. 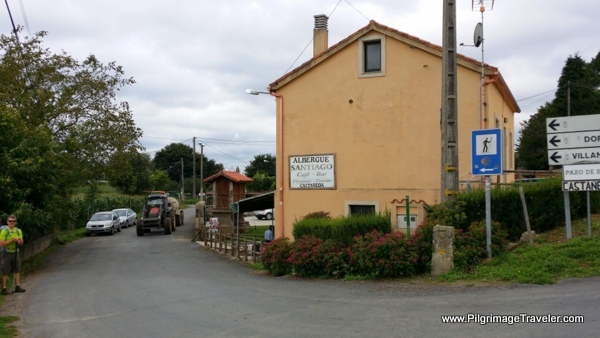 Just before town, watch out for the private Albergue and Cafeteria El Aleman, if you choose to stay in Boente for the night. 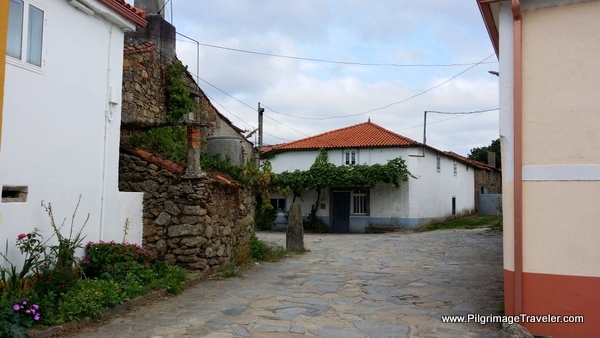 At the junction of the N-547, there is a lovely fountain and cruceiro. Here I am by the cross. The church is just down the road a bit more. This is a nice place for a rest, if you need, on the bench shown in the photo on the left. The Way turns right by the church to walk north of N-547, then crosses under a bridge and alternates to the south, staying close to its direction and nearby towns. it goes over and sometimes under the highway, but rarely on it. Here is another glimpse of the town of Boente on the north side of the N-547. The Camino crosses the N-547 and walks south of it to a town called A Fraga Alta. At the small, private Albergue Santiago, shown below, it turns left and continues on south of the highway. There is also a café bar here, if you need a food/beverage stop. 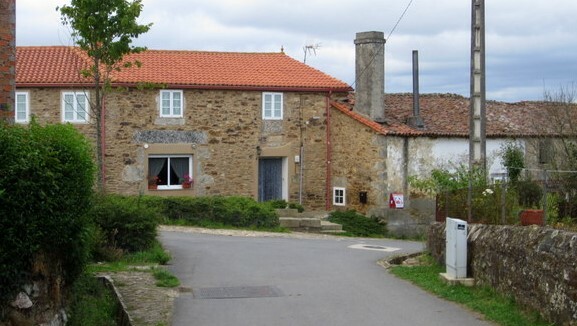 Shortly after the turn, above, you encounter the casa rural, La Calleja, After A Fraga Alta the road ambulates through the countryside through Pedrido and O Rio, where another casa rural, the FreeBird Castañeda can be found. In O Rio at this signpost, there is a nice picnic area in the shade to left by the river. 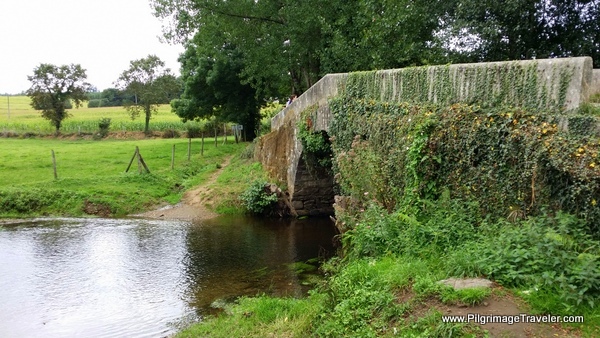 When you reach this old Roman bridge over the River Iso in Rivadiso, there are only 3 kilometers left to go to Arzúa. It is a wonderful and quiet place. Just after the bridge, are three accommodations, the municipal Albergue Público Municipal de Ribadiso, the Pensión Ribadiso and finally the Albergue Los Caminantes. A bit farther onward is the Albergue Milpés. All four of these places are in a quiet setting, if you prefer it to a larger town. Just before Arzúa the French Way joins the N-547 and walks on a nice dirt path on the south side of it. 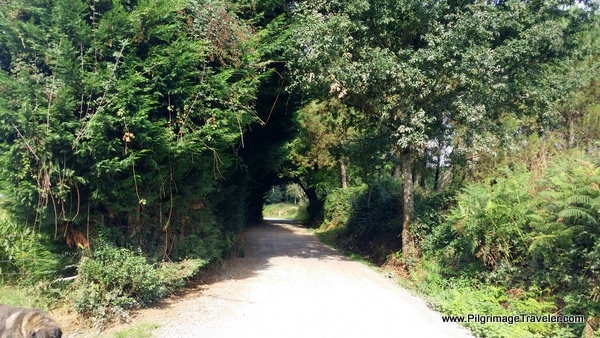 When you enter this hedge-lined path you know that Arzúa is very, very close. I loved the protected feel of this path into the city. It certainly shelters you from the risk and the noise of the increased traffic. Good job Camino engineers! Below is the "before" and "after" shower and rest photos! Here I am, when we first arrived in Arzúa, before checking into our pension. Here also is Rich, with no pack and fresh-looking after we had a beer, checked in and rested, and were ready to hit the town for dinner! I ignored Rich and kept on working on categorizing my photos, and posting to Facebook. In about five minutes he says again, "Call Camino Mother." I'm not sure why he didn't call her, but I suppose it was because it was I who had her phone number! So, I called Glyvia. Much to our astonishment she was in Arzúa! We had caught up to her, even though we had spent an extra day in Lugo. 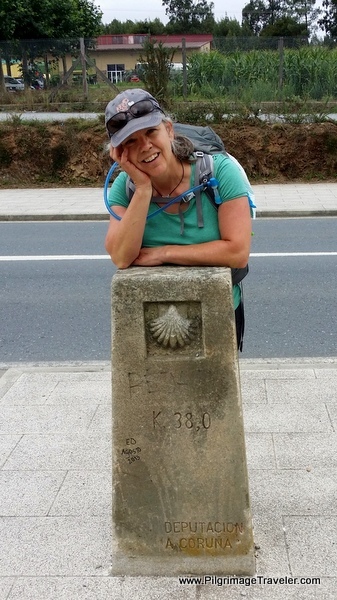 On her first day after Lugo she had gotten lost and after a one-hour detour grew discouraged and ended up staying in San Román (see our day ten). She had spent the second night in Melide. 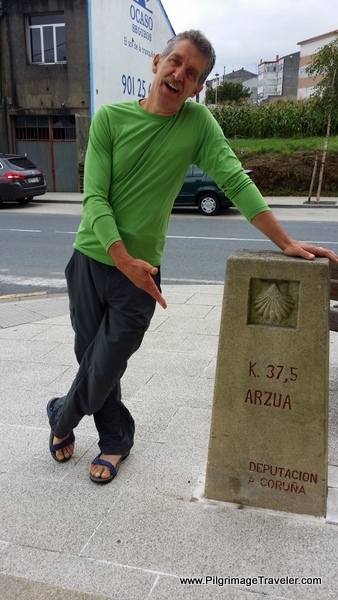 Today she made it to Arzúa! Her niece, Saskia had gone on and she was now with Magdalena, a bit further on. 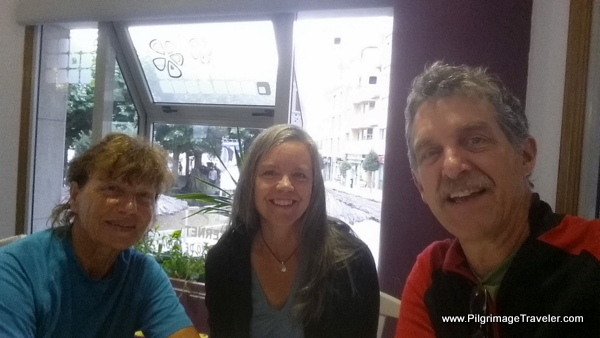 After our rest, we met Glyvia at the church in the center of Arzúa and wandered around to find this café. It was sunny, bright and inviting, so we walked in for a bite. I cannot remember the name of it, but we really only had small dishes and wine, not a full dinner. Shortly after sitting down, in walks Mattias, another member of our Camino family. Not only had we caught up to Glyvia, we had also caught up to Mattias, who was having foot/blister trouble. He joined us for a beer. We were so very happy to see our familiar Camino family faces again! 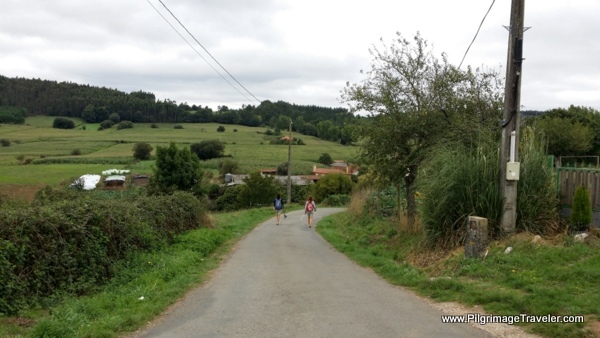 Perhaps my mind set put me in a more closed place when we arrived on this day eleven of our Camino Primitivo, part two. I am not exactly sure. But I do know that we walked very quickly and with much endurance on the French Way, partly because the terrain was much, much easier and flat, partly because we were not as desirous of the company of throngs of pilgrims with the concomitant heightened tourism and partly because we were eager to arrive in Santiago de Compostela. By the afternoon, we were growing sick of being polite and we just wanted to "get there." We chose to keep our pace throughout the "races." Sure enough, whenever we would come to a hill, the racers would fall back and then disappear. Whether or not it was the Tortilla Francés we had in Melide, or our conditioning in the mountains of the Primitivo, we were very strong on the hills. While I never set out to race, I must admit that with all the peregrinos now out and about, it did help to fuel me on, though I arrived very tired and aching in Arzúa after a long, grueling 28 kilometer day! I observed all this racing behavior with amusement, tried not to judge and just kept to our pace. I will, however, claim my somewhat competitive nature! 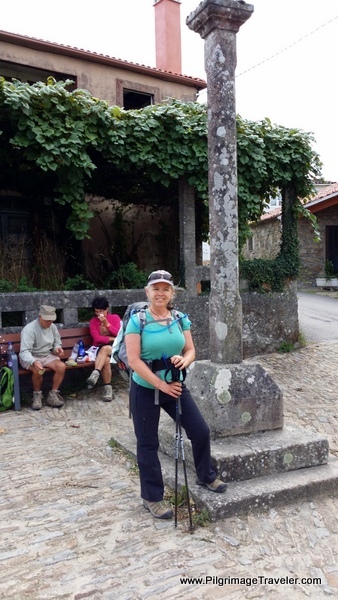 I did feel proud of what we had accomplished on the Camino Primitivo. Indeed, we had changed our course of direction, in many ways when we joined the Camino Francés. One day, we might do the entire French Way. And then, we might not. The jury is out. The French Way is not good or bad, just a different experience. 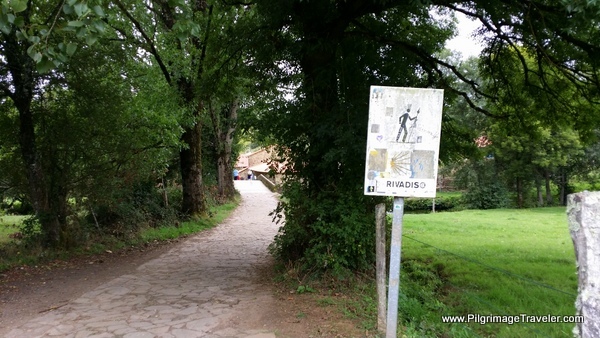 May your own day eleven on your Camino Primitivo, part two (Francés) be filled with a better knowledge of the different Caminos, why you are who you are and why you choose one Camino over another! May you stay steady in your own pace and soar over the clouds to get a complete view beyond the horizons! Buen Camino!